A warm and spiced eggnogg style cocktail. Beat egg whites and salt until foamy in a large glass or metal mixing bowl until stiff peaks form. Lift your beater or whisk straight up: the egg whites should form a sharp peak that holds its shape. Beat the egg yolks to soft peaks in a separate bowl. Beat the butter and confectioners' sugar in a large bowl until light and fluffy. 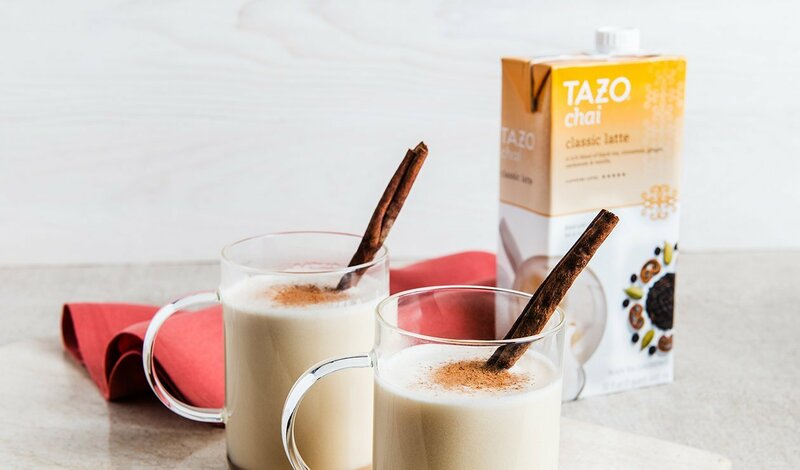 Add the egg yolks, Tazo Tea Concentrate Classic Chai Latte and fresh juiced lemons to the butter mixture; mix. Stir in the egg whites; beat until well blended. Batter can be frozen or kept in refrigerator for several weeks. Place 3 tbsp of prepared batter into the bottom of a coffee mug. Put in the alcohol and then pour the hot water over the mixture and stir. Top with 1 tbsp of the batter.